New bus and coach registrations fell by 8.8% in the third quarter of 2018, according to figures released by the Society of Motor Manufacturers and Traders (SMMT). In total, 1,820 vehicles joined the UK’s roads in the period — 176 fewer than in Q3 2017 — as the market continued to feel the impact of low business confidence and uncertainty over Clean Air Zone plans. From July to September, demand in all three segments fell, with a 26.8% decline for double-deck buses, while single-deck buses and minibuses declined by 8.9% and 3.8% respectively. In the first three quarters of 2018, 5,642 new buses and coaches were registered in the UK, representing a fall of 5.6% compared with the first three quarters of 2017. Double-deck buses experienced the largest decline (24.0%), followed by single-deck buses (12.9%). That said, minibus registrations increased in the first nine months of the year, by 6.1%. 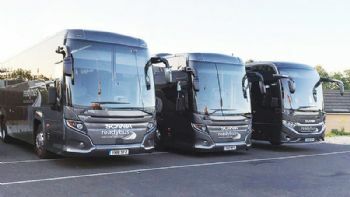 Mike Hawes, SMMT chief executive (www.smmt.co.uk), said: “While the cyclical nature of the bus and coach market can result in fluctuating registrations, this seventh consecutive quarter of decline is concerning. "Operators face political and economic uncertainty, alongside confusion surrounding the upcoming Clean Air Zones that will differ by local authority, which is inevitably affecting their confidence to invest in the latest low-emission buses. It was a similar picture with the UK’s new heavy goods vehicle (HGV) market, which declined by 7.0% in Q3 2018, with 9,853 heavy trucks registered between June and September. Registrations of rigid trucks were down 9.8%, with a 6.0% decrease in the six- to 16-tonne segment and an 11.9% decline in the greater than 16-tonne segment. Demand for articulated vehicles also fell — by 3.1% to 4,246 units. Despite a 4.1% drop in demand, tractor units remained the most popular vehicle, accounting for almost 43% of the market. Skip loaders and box vans were the only segments to record growth in Q3, up 11.1% and 2.4% respectively. It was a similar picture for the first three quarters, with overall HGV registrations falling by 7.5% to 30,308 units, with declines in demand for both rigids (9.9%) and artics (4.1%).